Is London the hottest place in the world to be a start-up? Megabuyte, February 2013. Original article here (£). There is a distinct buzz of optimism surrounding the London start-up scene. Yes, we could do with more money to create more opportunities, but everyone we’ve spoken to agree that London has come a really long way in being a nurturing hub for innovation. As the Valley is arguably approaching maturation, the London location is the hot newcomer that’s just now becoming established enough to be a real force to be reckoned with. We met with Julie Meyer, founder and CEO of Ariadne Capital, to talk about why London may well be the most exciting place in the world to be a start-up. “You can say what you want about the Empire, but the United Kingdom understands networking, says Julie Meyer, who grew up in Silicon Valley but opted for London as the base for her entrepreneur financing group. “London is absolutely conducive to start-ups and venture capitalists, and to the people who want to build the future. Absolutely. That is why I choose to be here. This is London! As far as I am concerned, this is the center of the universe.” Meyer laughs, but she’s also being serious. We’re chatting across the conference table in her offices near Trafalgar Square, from which Meyer runs the Ariadne Capital Entrepreneurs Fund. BeatThatQuote, Espotting, Monitise, SpinVox and Zopa are among the finds of the woman who founded the First Tuesday entrepreneur network and sold it, in 2000, for $50m. UK software groups have the potential be as big as US ones, is Meyer’s message, which is a refreshing point of view so shortly after UK software leader Autonomy went American, to HP. However, last year’s in-depth industry study from Startup Genome found that Silicon Valley has 30% more founders that want to change the world than London or New York, while London has twice as many founders wanting to make a quick sale compared to the other two. Having said that, our interviews with London startups found that most founders wanted to build instead of sell, seeing no reason why they couldn’t carve out a niche in the new internet-augmented world alongside their Valley peers. Posted on 02/08/2013 by Jess. 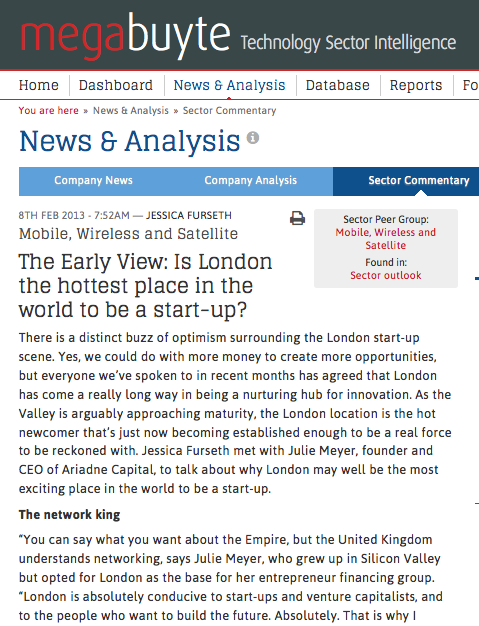 This entry was posted in Technology features and tagged london, startup hub. Bookmark the permalink.